This year, alone, around 9,000 hotel rooms in 85 hotels in the categories from budget to luxury came into the market in Germany, and for 2009, 174 hotel projects with a total of around 27,000 beds are to open. Openings will include the Mövenpick Düsseldorf (201 rooms) in January, the Hilton Airrail Center, Frankfurt/Main (247 rooms) in February, and the Golf and Wellness Hotel Budersand on Sylt (79 rooms) in May. „The number of hotel projects has recently been corrected downwards slightly, but Germany can still be considered one of the most important locations for hotel development in Europe,“ Rolf W. Schmidt, managing partner of CHD Expert / Marktplatz Hotel and publisher of tophotelprojects.com, explains the development of the hotel market. So far, only few project cancellations have been observed. Overall, the increase in hotel projects showed no major setback. Unaffected by the ghost called the global economic crisis, the top hotel industry continues to grow rapidly. 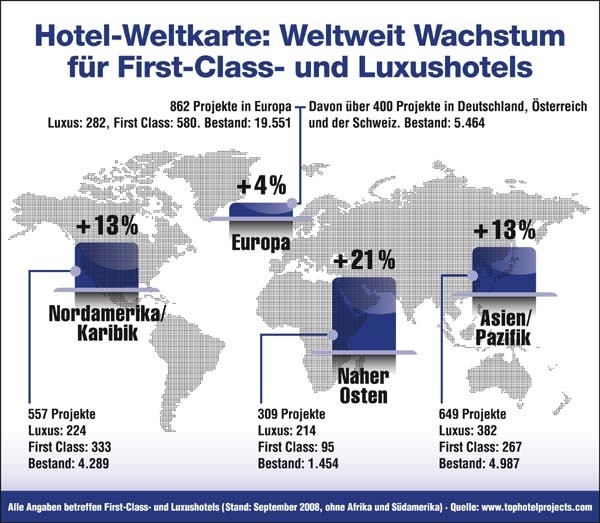 An amazing 25 percent growth is expected for the German hotel market’s 5-star segment in the next five years. A total of 280 first-class and luxury hotels with 47,000 guest rooms are being planned. The newly developed properties will include domiciles of renowned chains such as Hilton, Global Hyatt, InterContinental Hotels Group (IHG) or the emerging chain 25 Hours, as well as individual hotels. World wide, there are currently about 500 top hotels with almost 199,000 rooms close to opening. A little over a quarter of destinations are located in Europe (28%) and North America (27%), respectively, 41 percent of openings will take place in East Asia. The largest hotel to start welcoming guests soon is the Marina Bay Sands Hotel in Singapore with 2,600 rooms. The large-scale project of Las Vegas Sands Corp. will be completed in the course of the next year. The Middle East is facing an overproportionate increase of top hotels with a growth of 21 percent (corresponding to 309 hotel projects) of planned projects. But in Europe, as well, another 862 hotel projects (4% growth) are being planned. The project database tophotelprojects.com currently comprises 3,070 first-class and luxury hotel projects world wide, detailed with data and contact persons. About CHD Expert / Marktplatz Hotel GmbH: The business branches range from market research over direct marketing to data management. The company philosophy is „Know it and do it!“ The company was founded 1997 as Marktplatz Hotel GmbH and since about seven years ago belongs to the internationally operating CHD Expert Group with branches in all economically significant European countries, as well as the USA and Canada. CHD Expert is part of the Preferred Partners of the German Hotel Association (IHA). Its clientele includes well-known companies in the fields of food & beverages, furnishing and media, amongst others. More at: www.chd-expert.com.